HANDLE AND CARVING BLANKS Preshaped in hardwood, glass eyes, epoxy, studding, starter kits etc. HORNS Horns & antlers, preshaped handles, caps, spacers, bending jigs etc. BOOKS on stickmaking and carving. Page last updated March 2019. Please click on "Refresh" or "Reload" to ensure you see the latest information each time you visit. Several sizes to fit most sticks. These are "bell" shaped with good grips on the base and a metal washer inside to stop the stick wearing through quickly. Type quantity for each size in the box then click "Add to Cart" button. Discounts are for 10 or more of a size. 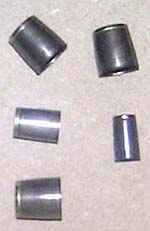 If you want to order rubber ferrules to fit the shanks you are ordering from us NOW then use this section. Small rubber ferrule with 12 mm aperture to fit most "Leki" style Trekking Poles. NB These DO NOT fit the Alpine Spikes on this page! 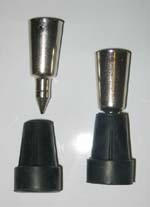 Standard ferrule on left, Umbrella ferrule on right. Both are approximately actual size. 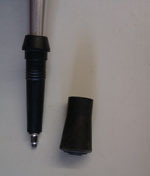 Small rubber ferrules to fit over umbrella tips or very small cane tips. Internal diameter is just under 9mm but will stretch to cover tips up to about 12mm max. 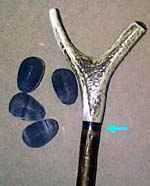 Orthopaedic Ferrules (Also called crutch pads). Hard wearing and good grip on most surfaces - broad base gives extra steadiness if you are a bit "wobbly" on your feet! If you want to order orthopaedic ferrules to fit the shanks you are ordering from us NOW then use this section. Large, flat base that gives extra stability for anyone with poor balance. The ferrule is so stable that the stick will stand upright on its own so can be left without the need for hanging it or leaning it against a chair, table etc. The socket is quite flexible and will accommodate most sticks from 3/4" (19mm) to 7/8" (22mm). 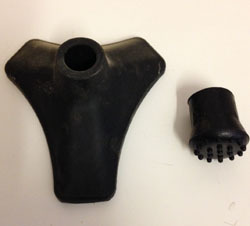 Straight-sided rubber ferrules with flat bases. More suitable for table or chair legs but some people prefer them on sticks because of the neater appearance than the bell-shaped ones. Only two sizes in these. 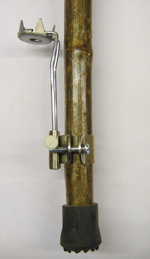 (Brass with flat steel plate welded to brass base). STOCKS ARE LIMITED as they are no longer being manufactured but we still have a reasonable stock of SOME sizes. Lacquered finish that gives them a grey/brown colour. This can be rubbed off with steel wool and metal polish to reveal bright brass. Taper the end of the stick to get a tight fit and secure with epoxy or pins (see lower down) or use the traditional way of crimping the rim two or three times with a sharp nail and hammer. 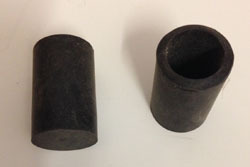 The length of each ferrule is the same (approx one inch) regardless of diameter. If you want to order Steel tipped ferrules to fit one or more shanks you are ordering from us then use this section as you won't know the sizes. We don't guarantee any particular sizes or number of each in the packs (that's why they're mixed!) but generally sizes 10 to 14. If you want to specify sizes you will need to order individual ferrules. 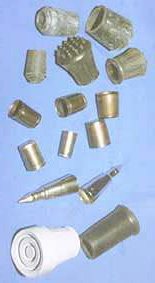 PLAIN BRASS FERRULES, without the steel tips, just a brass base at the narrow end. These are much cheaper but not as hard wearing. These have an antique-effect brown coating but can easily be polished to bright brass using steel wool and metal polish. No 16 = one inch etc. If you want to order Plain Brass ferrules to fit the shanks you are ordering from us AT THE SAME TIME then use this section. Special internet offers are ONLY available when ordering ONLINE! Taper the stick to get a tight fit and secure with one or two small pins (see lower down) through the holes already drilled near the open rim. All measurements are for the external diameter and are approximate. Please note that these are budget priced items and and can show some signs of oxidation. This can be easily removed with fine abrasive or matal polish and in use does not affect performance in any way. Now with optional rubber ferrule to fit over spike when back in town! 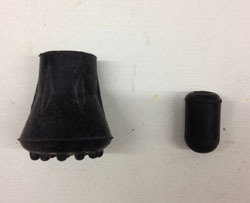 Rubber ferrules are £1.80 each. If you want to order Alpine Spikes to fit the shanks you are ordering from us at the same time then use this section. NOTE: The folding Ice Ferrule does NOT come with a rubber or other ferrule so if you don't already have one please order one for your own stick from the selection of ferrules above. 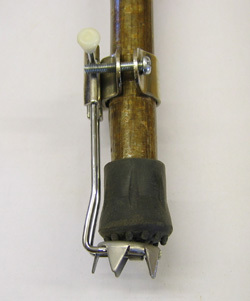 Clamps on to "standard" sizes of sticks (20 to 30 mm thick) by fitting two screws (long and short ones supplied in each pack) through the metal parts. 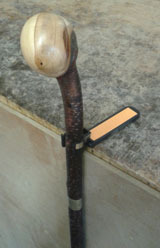 The stick is not damaged and the Ice Ferrule can be removed and stored during the summer. 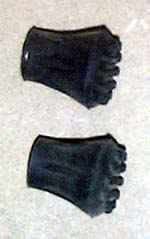 When not in use the ice grips fold out of the way and the normal rubber or metal ferrule (not supplied) is used. When required the ice grips simply click into place below the normal ferrule. Brilliant! My own mother tested one of these for me for a winter. Sadly, mum passed away in early 2015 but she recommended the ferrule and several of her friends now have them too! Engraving up to 30 characters costs only £15 (not including price of collar). The more characters you have, the smaller they need to be engraved to fit on the collar. 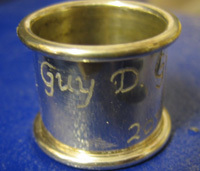 If you would like any of the metal collars (below) engraved then enter your lettering in the box and click on "Engrave". MAKE SURE YOU ALSO ORDER A COLLAR FOR US TO ENGRAVE!!! If ordering more than one collar but not all engraved, make sure you order the engraving here first then order the collar you want engraving - order any other collars AFTER the engraved one so we can tell from the order form which one is to be engraved. You might also like to put a note on the order form to make sure there is no confusion. NB Engraving is done by hand-held tool and not by machine. Type name/date etc. that you require in the box. Max 30 characters (including spaces, full stops etc) please. MAKE SURE YOU ALSO ORDER A COLLAR FROM BELOW!!! (If you don't we'll assume you want brass and charge you for it). The internal diameter is approx. 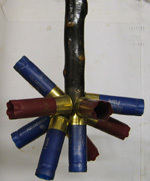 21 mm, 23 mm or 25 mm. Due to increased world prices of brass and nickel we have reluctantly had to increase our collar prices by a small amount. We only have a few of these so can't do discount packs. Use the section above if you know what sizes you need. IF YOU DON'T KNOW WHAT SIZE COLLAR(S) TO ORDER BECAUSE YOU ARE ORDERING THE SHANKS or KITS FROM US TODAY, THEN USE THESE SECTIONS. To order one or more beaded BRASS collars to fit shanks in this order see left. To order one or more beaded NICKEL collars to fit shanks in this order see left. If you would like any of the metal collars (above) engraved for just £15 then enter your lettering in the box and click on "Engrave". MAKE SURE YOU ALSO ORDER A COLLAR!!! NB Engraving is done by hand-held tool. Type name/date etc. that you require in the box. Max 30 characters including spaces (not salmon or pheasant collars) please. MAKE SURE YOU ALSO ORDER A COLLAR FROM ABOVE!!! (If you don't we'll assume you want brass and charge you for it). Useful if you have already made (or bought) a stick and fitting a collar is not an option. The disc is drilled to take two silvered pins (included) that you can use to attach the disc to any stick - you may wish to put a dab of epoxy on the back to make it even more secure. Price only £18.00 for the disc AND the engraving and the pins. Max two rows of nine characters please (including spaces). The discs are obtained from a local engraver (who does the engraving) so it can take anything up to a week after you place the order before I get it back. I press the disc into a shallow curved profile and drill two pin-holes for easier fitting on your own stick. 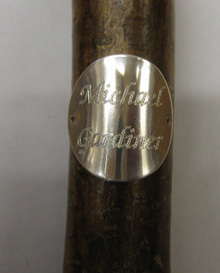 The engraver normally chooses suitable lettering depending on the size and context. LIMITED NUMBERS LEFT. MANUFACTURE OF THESE HAS STOPPED AND NO MORE WILL BE MADE - WHEN THEY'RE GONE, THEY'RE GONE! 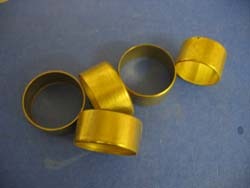 Plain Brass collars approx. 12 mm deep. The diameter measured is the more open end and is approximate. Use epoxy and/or pins to secure collars in place. For engraved collars see above. Roughly cylindrical sections of antler with some of the core drilled out and the rough edges sanded. You might need to file and sand the collars to fit your own sticks. I make these to order myself. Pins for securing collars or ferrules. 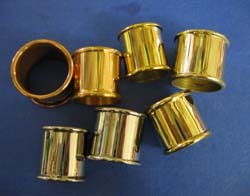 Brass Pins (brass plated steel). Keep the caps small and rounded otherwise they are likely to get knocked off in use. Flat sides and tall profiles are not likely to stay on for long! Buy in packs to save money! White bone 25 to 30 mm wide, 3 to 5 mm thick. 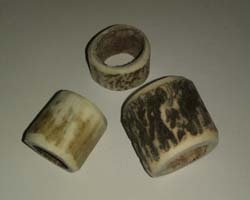 Black buffalo horn or white bone slices for capping stag horn or as spacers between joints (see blue arrow on second picture). Folding gadget which clips onto most canes (up to around 1" thick (25mm) and enables the user to hang the stick on the edge of a table or shop counter, freeing both hands but without losing sight of the stick. The holder is spring loaded so it hangs downward when not in use and a useful reflective strip helps the user to be seen at night. The underside is covered in a soft foam material to prevent damage to the table top.